For a span of six hours Saturday, Detroit Avenue was no longer simply the main street of Downtown Lakewood. Rather, this bustling avenue transformed into an urban playground for families, friends, festival-goers, runners, beer enthusiasts and music lovers alike to celebrate a vibrant city and gorgeous summer evening with members of their extended community. 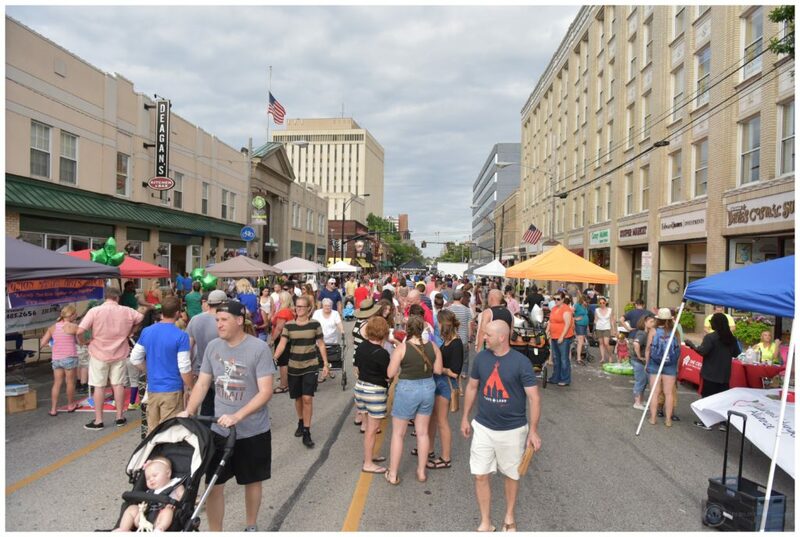 Lakewood Summer Meltdown 2016 – sponsored by Melt Bar & Grilled and presented by LakewoodAlive – attracted an estimated regional crowd of 10,000 to the heart of the city along Detroit between Elmwood and Marlowe Avenues. 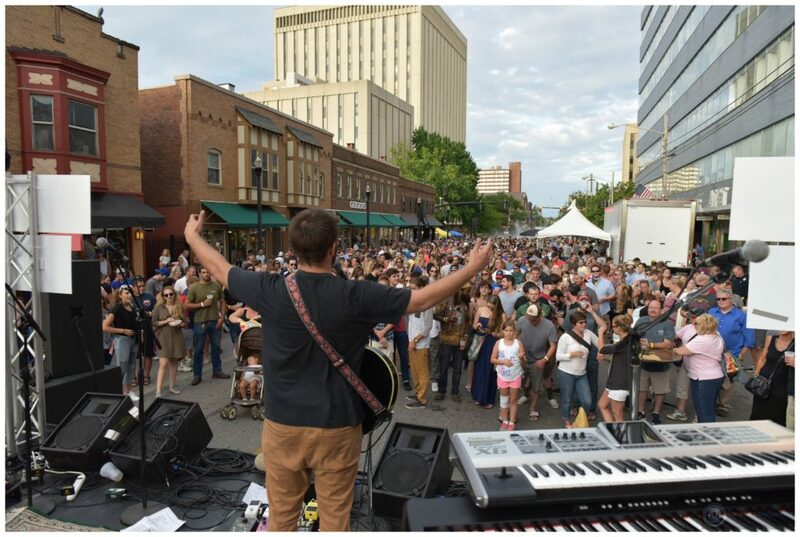 Attendees at the seventh annual installment of Lakewood’s summer street fest were not disappointed, as they enjoyed everything from street vendors to road races to a beer garden with live music. The Summer Meltdown got underway at 4 p.m. with the street festival component, featuring 75 vendors, food trucks and local eateries, interactive activities and exercise demonstrations along the western half of the festival. Meanwhile, the eastern end featured the ever-popular skate park and “Water Moose” sprinkler park. Joey Strunk created the “slide to unlock” skateboard ramp. 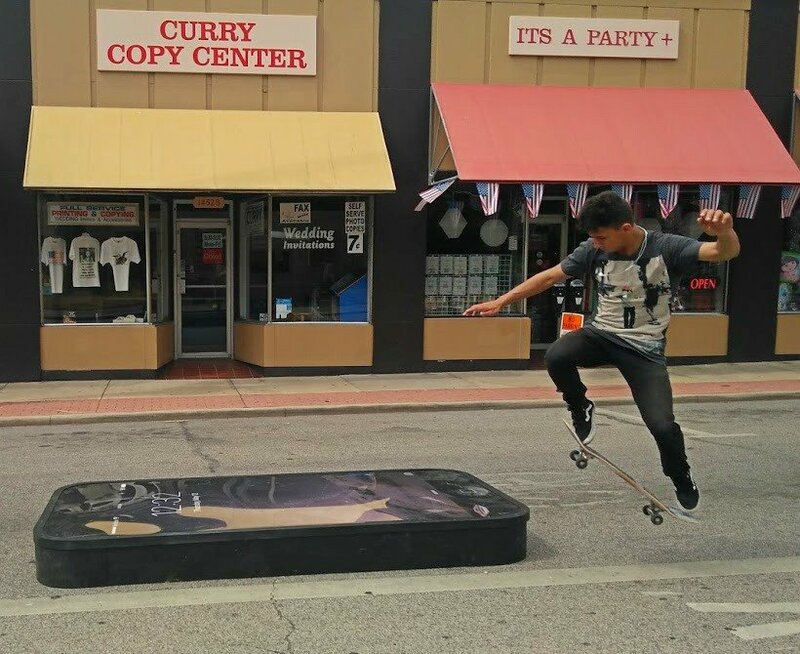 Joey Strunk, 21, an intern for Cleveland Institute of Art’s Creativity Works program, premiered “slide to unlock,” a skate park sculpture series that includes a skate ramp he created as an oversized replica of an iPhone. Strunk and fellow skaters took turns performing tricks with his artwork, which will eventually serve as a permanent fixture in the Skate Kitchen, Public Square Group’s mobile pop-up skate park. “I just wanted to provide a different take on art and skating, and I’m pretty happy with how it turned out,” Strunk said. Lakewood native Michael Gill constructed the initial version of his Water Moose sprinkler park six years ago with assistance from Lakewood Hardware. 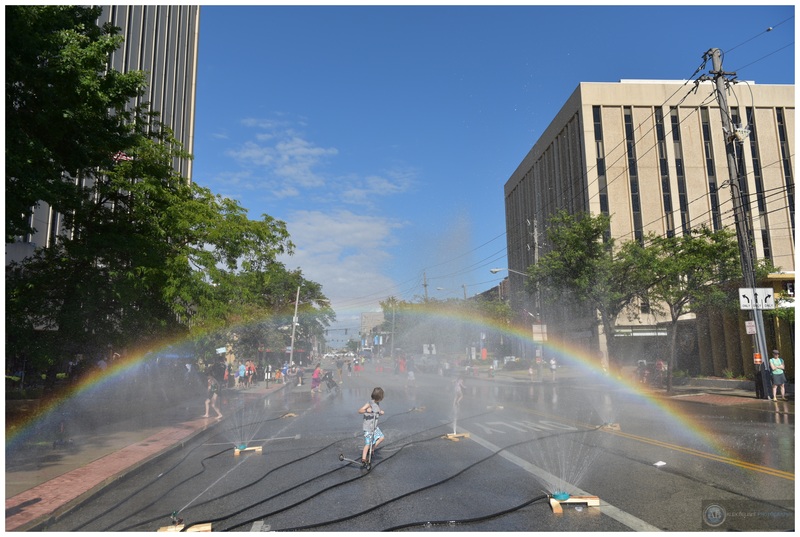 This web of sprinklers connected to a fire hydrant has developed into a fan favorite at the Summer Meltdown, inducing shrieks of delight from wet but happy children. Speaking of fan favorites, the 1 Mile Kids Fun Run – sponsored by Lakewood Family YMCA – once again proved to be a highlight of the Summer Meltdown. 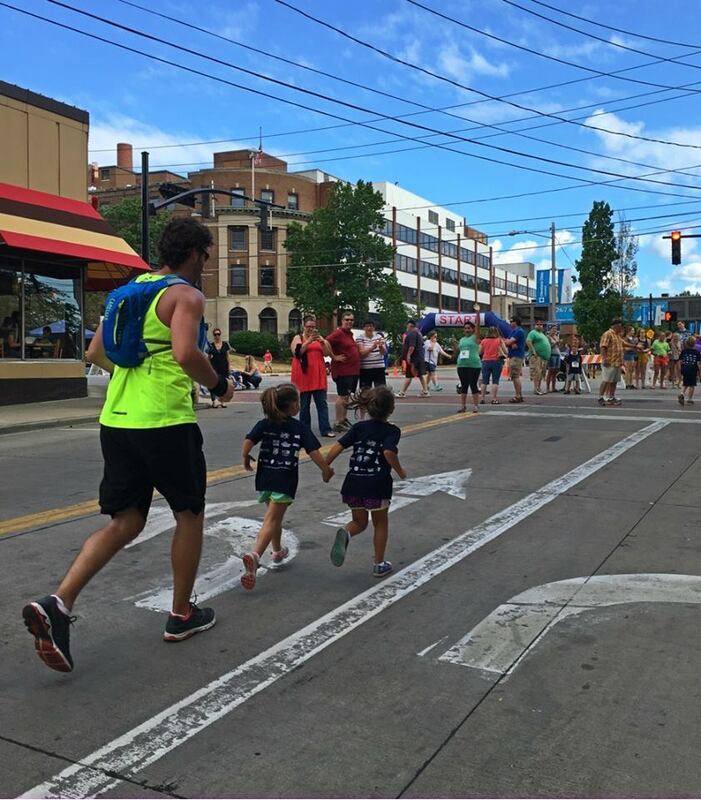 More than 100 children (some accompanied by parents) participated in this out-and-back race up Belle Avenue, with some holding hands as they crossed the finish line. First-place finisher Charlie, 11, rose his arms in triumph upon completing the mile run. “It’s really fun, hence the name,” said Charlie before heading to the Water Moose to cool off. The Meltdown 5K saw more than 500 runners – the largest group yet – take off along a fast course through the neighborhoods east of Lakewood Park. 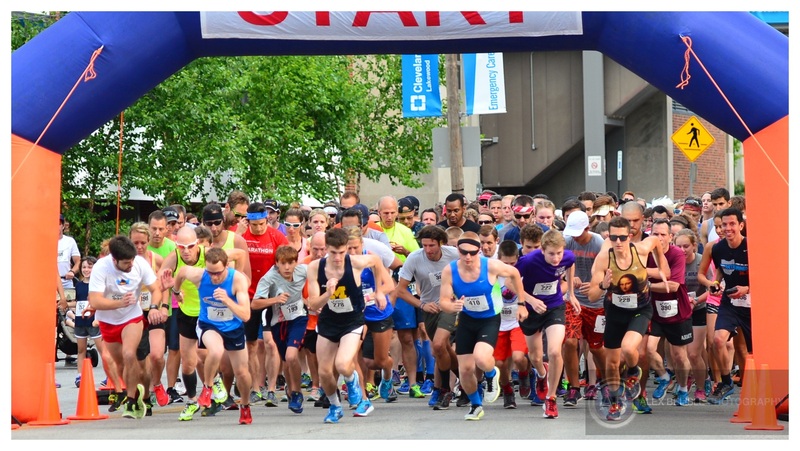 Runners enjoyed a rare evening race, glimpses of Lake Erie and personal-best race times. Logan Broadbent and Sarah Horbol placed first among male and female participants, respectively. These twin girls held hands across the finish line of the 1 Mile Kids Fun Run. Sponsored by Buckeye Beer Engine, the Gary K. Bish Memorial Beer Garden drew upwards of 2,000 attendees to enjoy craft beers like the Lakewood Lager and Summer Meltdown Ale from Buckeye Brewing Company. Beer enthusiasts complemented their beverages with food from local vendors. LakewoodAlive thanks its sponsors, its volunteers, the City of Lakewood, the Lakewood Police Department and all participants and attendees for making Lakewood Summer Meltdown 2016 a rousing success. Sponsors for the Summer Meltdown include: Melt Bar & Grilled, The University of Akron Lakewood, Buckeye Beer Engine, Discount Drug Mart, First Federal Lakewood, Cuyahoga Community College, Lakewood City Schools Community Recreation & Education Department, Lube Stop, Geiger’s, City of Lakewood, Lakewood Family YMCA, Cox Communications, thunder::tech, Peace Racing, Rozi’s Wine House, Westside Skates, The Lakewood Citizen, Window Universe and Ride + Workout.